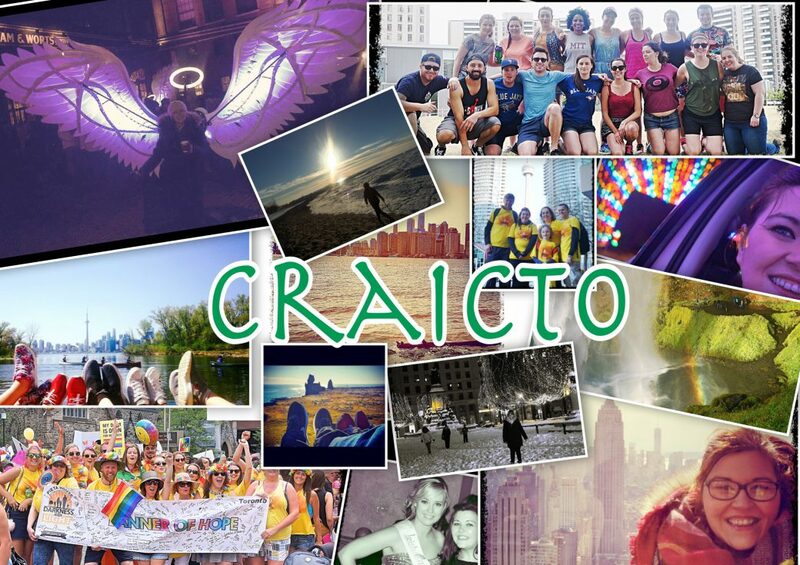 You’re new to the city, house and job sorted but now you want to join the Toronto Irish community, make new friends and develop a sense of self in Toronto, But how do you get started? After four years of living in Toronto, I’m still finding out about a broad range of groups with whom you can get involved. This weekend I had the pleasure of going to The Irish Person of the year Celebration, and I got to meet immigrants who came in the 50’s/60’s 80’s as well the newer immigrants, chatting to these people allowed me to see how successful you can be in Toronto and hearing how they kept their links to home was inspiring. Hence this list which attempts to highlight organisations that are out there. Obviously I’ll miss a few, so If you want to add any please let me know…. Saturday Mornings with Ceol agus Craic AKA Mark and Ken, broadcast live at 11AM EST on AM 1430 every Saturday morning. Sunday Mornings with Mr Hugho Straney, Hugho brings us songs from home every Sunday 10am-11 am on AM 1540. The Ireland Canada Chamber of Commerce: The Chamber’s community involvement includes: a monetary contribution to Ireland Park, support for many community organisations, and assistance for new immigrants through networking opportunities. They are connected to a number of groups and associations and serve as our membership’s voice in the business community in Canada and Ireland. The ICCCTO provide networking events that are ideal for business and socialising. If you are a new immigrant or have been here for years they can provide the venue for this. The Irish Cultural Society of Toronto: Aims to stimulate interest in, promote, sponsor and foster Irish culture in all its forms, be it historic, linguistic, music, drama, dance, sport or other forms of artistic entertaining or educational expression. They promote mutual understanding and goodwill among the members of the Society. They also sponsor and conduct activities the Society deems advisable to maintain, develop, promote and foster the Irish cultural heritage in Canada. Louise with her Rose of Tralee sponsors, The Irish Embassy. The ICST are partnered with the Rose of Tralee and if you are interested in representing Toronto in the upcoming Rose of Tralee you can find information here. Irish Design House: I know technically not an organisation but a great way to meet some Irish as well as develop a new hobby. Sinéad at the Irish design house has a sewing school The Green Seam that teaches you everything you need to know about sewing and pattern making. Based in a quaint sewing studio in Toronto’s east end in the beautiful Riverside neighbourhood where you can receive one-on-one attention in sewing, pattern making, pattern cutting and all the skills needed to design and manufacture your own garment. Classes can cater for beginners and start with the very basics, and also for those with experience who may need assistance with a particular project. You can find out more here or email hi@thegreenseam.com. 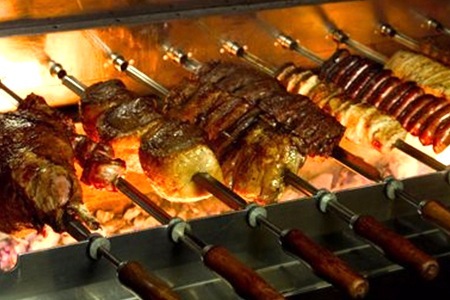 Copacabana Brazilian Steak House; If you are a meat lover – you have to go! 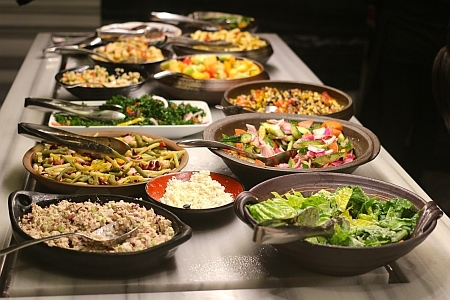 The restaurant is all you can eat, for a fixed price of $37 on week nights and $45 on the weekend. Whilst you dine, waiters will circulate to each table offering a choice of 18 different skewered meats to be carved table-side in unlimited quantities. 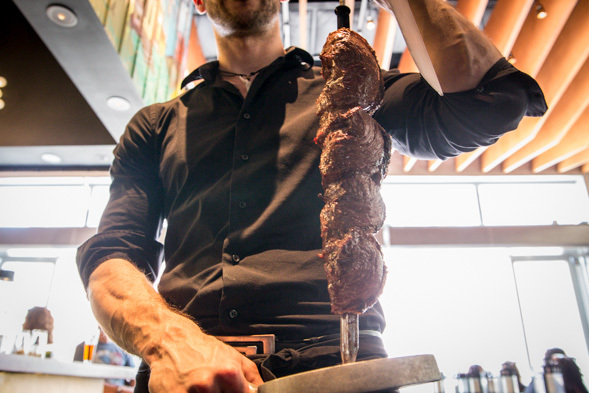 Copacabana boasts two locations in the city; Adelaide St. West and Yonge & Eg. There are also two outside the city, Niagara and Vaughan, so there’s no excuse not to go! My first time here was to celebrate a birthday. Ourselves and another couple went to the new location on Adelaide Street, on a Friday evening. Its super chic and funky exterior is lit up with neon lights, you would be forgiven for mistaking it for a nightclub. *FYI if you go on your actual birthday in a group of four or more you get to eat for free – who doesn’t love free stuff!!! Our server kindly told us to go and help ourselves to the salad bar and then they would come over with the meat. DON’T FILL UP ON THE SALAD! You have been warned! Friday and Saturday nights, is the time to go, talk about dinner and a show!! During our dinner we were treated to two shows, including salsa dancers and an aerial artist hanging from the ceiling above. Along with this they had a DJ playing some great tunes whilst we ate our dinner. Definitely somewhere I can’t wait to go back to – it is in my top three of Toronto. They have recently launched their new brunch menu available on Sundays from 10:30am-2pm. A New Dining Experience: Signs Restaurant. A restaurant staffed by all deaf Servers and bar staff, What a unique idea?! 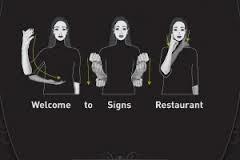 Signs located at Yonge and Wellesley, the new bar and restaurant — “where noise meets silence” — asks customers to order food and drink using sign language with assistance from a “cheat book” that illustrates how to sign menu items. I had no idea what to expect upon entering the restaurant, but I know the experience I had surpassed all those expectations. On entering Signs you are greeted and seated by the hostess, who explains Sign etiquette, the menus, and the handy Sign Cheat book. You are given time then, I presume to study up before your server is introduced. Our Server; Gaitrie was by far the most patient and helpful server, I have ever met. Whilst I feebly tried to order my drinks she interpreted my gestures, all while giggling and encouraging me to continue. This place is so much fun and at no point do you feel embarrassed by your signing inability. Also no need to worry about order mix ups, and mispronounced/misheard utterances, Your order is confirmed at the table with pictures. Perfect for us with our Irish lilt! Now to the food, The menu has a wide selection of foods from traditional Canadian fare to more international dishes. I had Pri Pri Chicken and my Pal had Potato Crushed Salmon, both delicious. Sometimes with restaurants with a unique concept I worry that the concept is the main selling point, but the food at Signs is amazing, and the wine list is pretty good too! I would totally recommend Signs Restaurant as a fun and educational dining experience. Quirky, unique, fabulous….All the words I would use to describe a Boyfriend Brooch. I stumbled across this talented lady one lazy Sunday whilst browsing Instagram and she has become my new obsession. Normally I like to keep finds like these to myself, but this I HAD to share…. 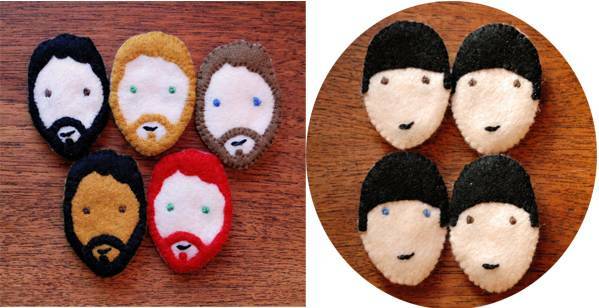 Hannah Browne and her hand made felt pins, depicting famous faces including the Beatles, The Fresh Prince, Ron Burgundy and also ‘custom’ boyfriends, encourage people to wear their hearts on their chest or hats or bags. 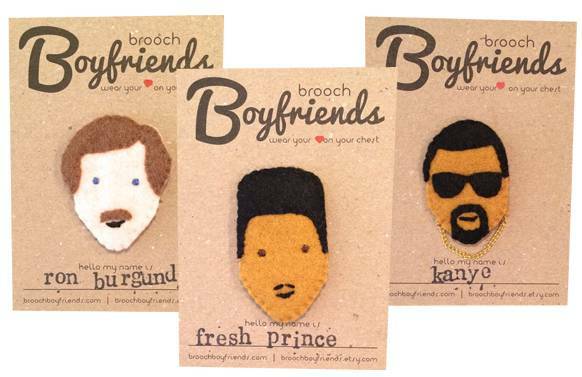 I had to get a Kanye brooch, but I don’t think I’ll stop there, I’m already thinking that my real life ginger could be immortalized in brooch form, she even does couple brooches, but I’m thinking that might be a bit much for my man friend. You can purchase Hannah’s pins on her Etsy store, the Drake General Store in Toronto. She visits various pop up shops and if you give her a follow on Instagram, shes super speedy to respond. These super cute pins retail from $15 and up. I cannot wait to add to my collection, I wonder could I have a little Niall Horan Brooch?! Who would your ideal brooch be modeled on?